Beautify your sweetheart's day to evening look with our black butterfly alice band. Whenever the occasion calls for an extra touch of elegance, this bespoke edition is sure to exceed expectations at her list of special events. 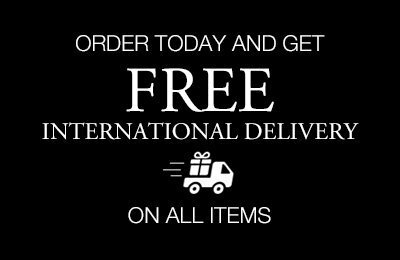 A must-have choice for bat mitzvahs, birthdays and weddings, this designer accessory includes a chic black grosgrain ribbon with a flexible silicone band to ensure your girl enjoys a comfortable fit all day. With a luxurious gold cut-out design, note how the butterfly and floral motifs lend instant couture appeal. This signature style is also adorned with glistening gemstone accents and promises to deliver an exquisite party look, this season and the next. 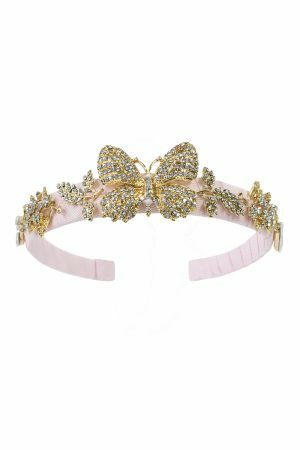 Crown your pride and joy with our blush pink butterfly hair band and transition effortlessly into springtime. 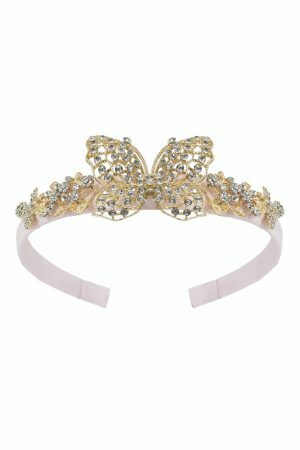 The perfect wish list addition for little girls who love to feel like princesses, this ornate occasion piece will ensure she looks the sparkliest of them all. Featuring a flexible silicone hair band wrapped in a blush pink grosgrain ribbon, now your daughter can take her occasion style from day to evening in a heartbeat. Hand-finished with precious gemstones offset by a molten gold butterfly and leaf design, watch your angel's special occasion look transform before your eyes. Graduate in first class style with our ivory butterfly sparkle hair band. Yours to treasure, this embellished accessory is the perfect choice for spring/summer parties and prom dates. Available in a luxurious ivory grosgrain ribbon with a flexible band to secure all her favourite hairstyles in place, this sparkle hair band is sure to become your girl's must-have outfit topper. This polished piece also boasts a molten gold butterfly and leaf motif and includes beautiful diamanté accents throughout. Let your girl express her inner ballerina with our pink butterfly hair band. Exclusively yours, this handcrafted hair band is laced with sparkle so your little one always looks pretty as can be. 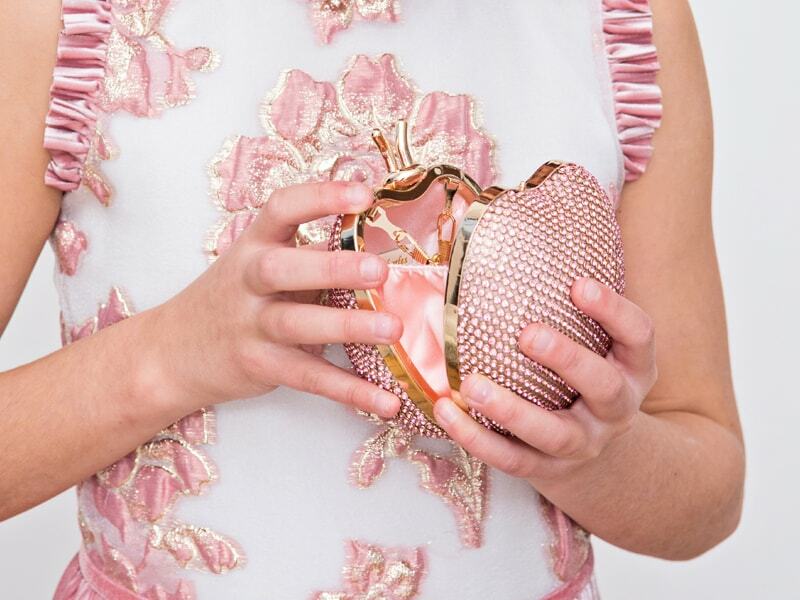 Available with a ballet pink grosgrain ribbon and a special springtime design, your angel can be sure to feel like a fairy princess when she adds this polished accessory into the mix. A molten gold butterfly and floral motif sets the tone for our signature diamanté accents, as seen throughout this fabulous new season style. Crown your princess with our ivory bridesmaid hair band. 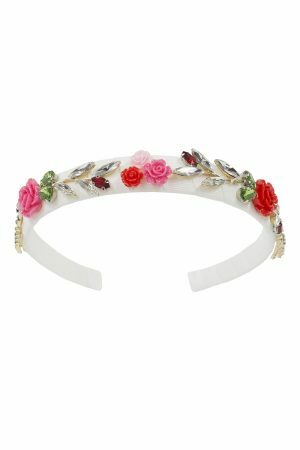 Prepare to celebrate the new season in first class style with this pretty floral headpiece. 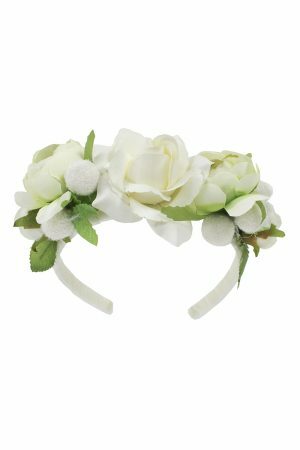 Available with an ivory grosgrain ribbon and decorated with a bouquet of white and cream roses, now your angel can enjoy a polished bridesmaid look every time. Note the matching pom-pom details which lend an extra touch of modern springtime elegance. Bring her favourite bouquet to life with our ivory rose Alice band. 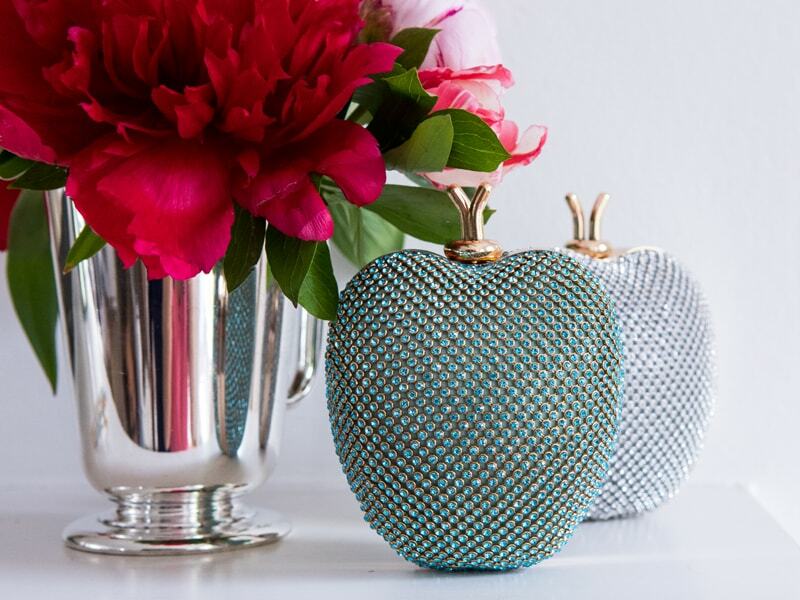 Beautiful and bespoke, this designer piece reflects the elegance of springtime in a way that's refreshingly original. Available in a timeless ivory palette with a luxe grosgrain ribbon, let your little one take centre stage in this special accessory edition. 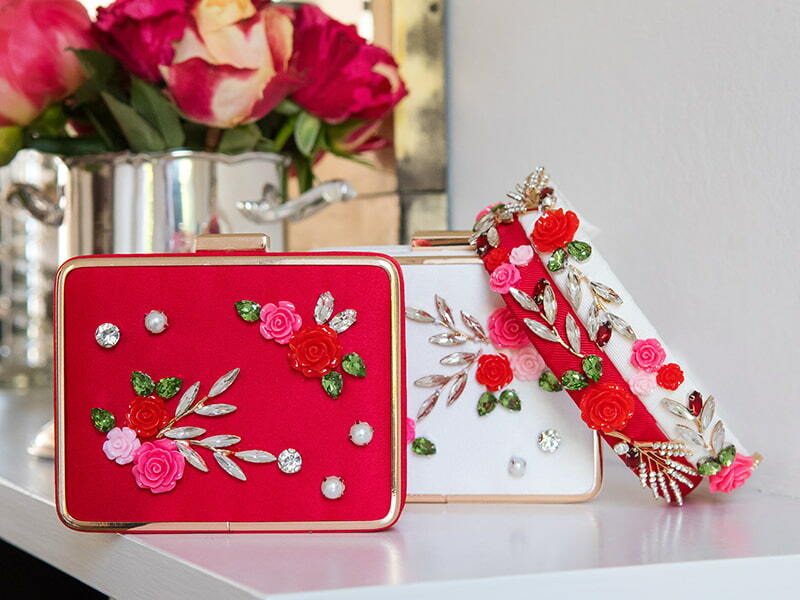 Featuring a colourful rose garden design of jewels and appliqué, every detail is hand-picked ready for your sweetheart to celebrate her favourite events in head-to-toe luxury. 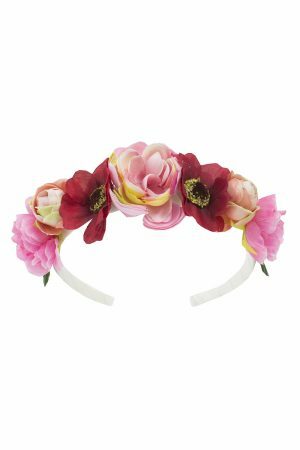 Celebrate the arrival of spring/summer with our pink floral hair band. Exclusively yours, this statement accessory is the epitome of flawless style and makes the perfect choice for weddings and parties. Available with a crisp ivory grosgrain ribbon and adorned with pretty petals throughout, everything about this floral piece says luxury. And if your girl wants to add a colourful touch to her finished occasion look, she will surely love our bouquet of seasonal hues featured throughout this fabulous hair band. Pick out your girl's dream accessory with our ivory, pink and yellow floral Alice band. Expertly crafted with beautiful floral details, this really is the finest statement piece to offset your angel's new season wardrobe. With a deluxe ivory grosgrain ribbon and flexible silicone band, your little one will be picture-perfect in this stylish yet comfortable hair band. Whether she has a birthday, wedding or a prom date on the cards, your daughter will be all smiles when she wears this pretty floral design complete with layered petals for a realistic and feminine look. This bespoke new season accessory also includes a matching ivory bow to add a final touch of elegance to her special occasion look. 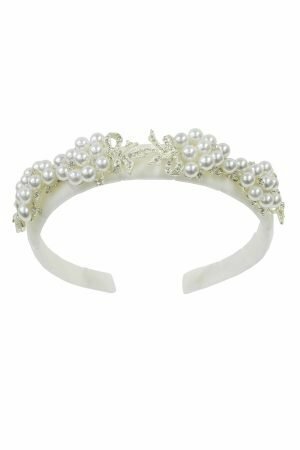 Crown your sweetheart with our ivory pearl birthday hair band. Perfect in every way, this iconic accessory is sure to make your girl feel like a princess at her next special event. Whether she's a bridesmaid or simply needs a little extra sparkle, this signature style is sure to win your angel all the compliments. Available in an ivory colourway, this polished piece is wrapped in luxe velvet ribbon and features a bespoke decorative design. With a row of sparkling bows against a white gold setting, this accessory offers plenty of star quality. The hair band is hand-finished with a selection of ivory pearls to complete your daughter's A-List occasion look. 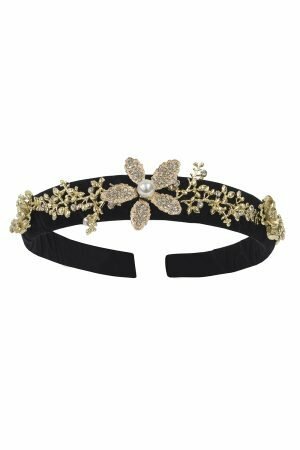 Greet the new season in star style with our black floral gemstone hair band. The ultimate statement for your girl's autumn wardrobe, this personalised piece is the epitome of evening glamour. Available in timeless black with plush velvet ribbon, choose this designer edition whenever your angel's occasion look needs a touch of sparkle. Embellished gold and jewel details add the A-List factor, and this hair band features our signature floral design to decorate your little one to perfection. Give your girl an 'A' for style effort with our sky blue floral jewelled hair band. Every special occasion dress needs a pretty finishing touch, and this cool blue accessory is sure to exceed your angel's expectations. 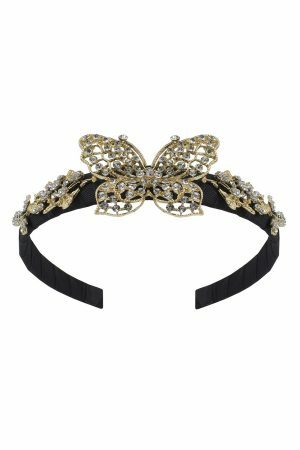 An excellent choice for birthdays and dinner parties, your daughter will be the belle of the ball when she frames her hairstyle with this princess-worthy piece. 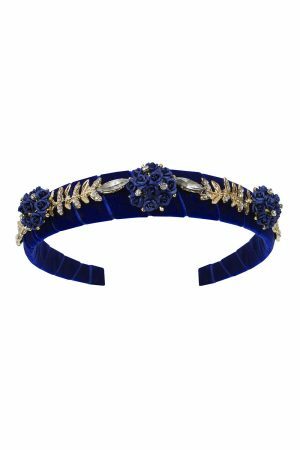 Available in a sky blue colour palette with a luxe velvet finish, this Alice band is embellished to perfection with gemstones and a gold floral motif throughout.